The mangosteen is a tropical fruit and is considered one of the most exquisite fruits in the world. 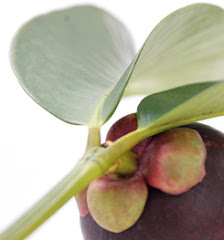 It is thought that long ago mangosteen originates in the islands of Sunda and Molucca in the East Indies. Mangosteen is also an evergreen tree native to Southeast Asia. The tree grows mainly in countries like Vietnam, Indonesia, Malaysia, Singapore, Philippines and Thailand. Its scientific name is Garcinia mangostana and belongs to the family Guttiferae. Hypericum perforatum (St. John’s Wort) and Garcinia cambogia are two of the relatives of the mangosteen which have already become well known as medicinal plants. For centuries Asian people have been using the Mangosteen in Chinese, Ayurvedic and folk medicine for various ailments and to support and restore optimum health. The mangosteen is also commonly known as "the Queen of fruits" in Asia and in the French Caribbean "the food of the Gods". Why it is known as "the Queen of fruits" in Asia? In Asia there is "the King of fruits" - the notorious Durian. And the locals consider durian a "heaty" fruit. To counteract the "heatiness" of this durian, mangosteen fruit is taken for its wonderful cooling effect. If you don’t believe this, try it out! Well, that is how the locals refer mangosteen as "the Queen of fruits". Isn’t that interesting? Another story has it that Queen Victoria is said to have offered knighthood to any one who could bring her this exotic intriguing fruit. Fittingly, mangosteen is known as "the Queen of fruits"! Mangosteen is a rather fussy tree and quite difficult to grow. The trees are extremely sensitive to climate and love high humidity and an annual rainfall of more than 50 inches. Which is why the tropical regions are the best place for mangosteen. 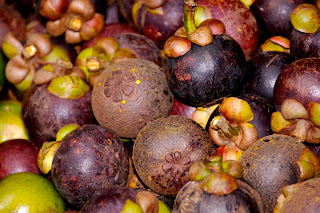 The mangosteen trees cannot tolerate temperatures below 40°F or above 100°F. It flourishes best in deep soil, rich in organic materials especially sandy loam and laterite as the tree does not adjust to limestone. A mangosteen tree takes from 7 to 10 years to yield fruit. It is really one of the slowest growing of the tropical fruit trees and can reach 75 feet in height. And fruiting is only twice a year! The leaves are leathery and the fruit with a hard, purplish-reddish rind and sweet irresistible juicy white pulp. Each mangosteen must be carefully picked and the average mature tree yields about 500 ripe mangosteen fruits. Some mangosteen trees can yield as many as 5,000 and the trees can continue to fruit for up to 100 years. What an amazing and miraculous fruiting tree!